This rugged, welded, double-walled steel cabinet has twelve inner compartments that are larger than standard shelving in order to accommodate over-sized herbarium sheets with ease. The cabinet also features a powder-paint finish and a unique “lift-off” door that’s quickly removed from its hinges, allowing you to easily move several drawers at once. The door also features an insect-proof elastomeric seal for airtight storage, a locking handle, and a chrome label holder. 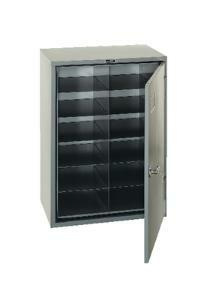 Cabinet measures 29 1/8" x 18 3/4" x 40"; shelves are 12 1/2" x 17 1/2" x 6"; weight: 148 lbs.